A new report released this week outlines, in great detail, the potential health and economic costs to California from climate change — everything from premature deaths due to heatstroke to anticipated spikes in West Nile virus, Valley fever, and even kidney stones. The report was commissioned by state Sen. Ricardo Lara, who will soon be giving up his senate seat after being elected insurance commissioner earlier this month. "For the first time we have a California report that combines the latest research on our health and the 'new normal' of extreme wildfire and climate-caused events," Lara wrote to KQED in an email. (Gov. Jerry Brown recently amended his own climate vocabulary, calling global warming impacts "the new abnormal.") The senator was in Washington D.C. presenting to the World Bank on the report and on his bill to limit hydro-fluorocarbon (HFC) refrigerants, which are potent greenhouse gases. The report contains no new research; it's a review of existing literature, an attempt to outline both the current state of climate change in California and the expected health effects on the state's population in coming years. Among the warnings: the Central Valley may experience heat-health events that last two weeks longer, while the northern Sierra region can expect four to 10 times more heat-health events than currently. "There is consensus among experts that by 2100, California will see maximum average temperatures increase by 5.6 to 8.8 degrees Fahrenheit above 1960–2005 temperatures," says the report — depending on whether emissions continue rising or decrease. By 2050, as many as 6,700 to 11,300 premature deaths are expected due to rising temperatures, which can exacerbate existing conditions like heat disease or asthma. Poor air quality will increase the incidence of respiratory illnesses. The intensity and frequency of storms will increase death and injury. Higher temperatures will also lead to the growth of disease-carrying mosquitos and ticks, as well as food-borne pathogens. "What this report shows is that we need to be discussing how to address the lingering effects on public health, our air and our food," said Lara. Here are some of the details laid out. You can also read the full 80-page report. Increases in temperatures have dramatic impacts on the health of the community. In the state's nine most populous counties, from 1999 to 2003, rising temperatures increased the risk of hospitalization for heatstroke by 342 percent, for dehydration by 10.8 percent and for renal failure by 7.4 percent. There was also a 1.7 percent increase in mortality across the state. During heat waves those numbers can be higher. Studies tracking the 2006 heat wave found a 9 percent increase in mortality per 10-degree increase in temperature in the affected counties. That caused about 600 heat-related deaths over the two weeks. High temperatures are also associated with pre-term birth. From 1999 to 2006, a 10-degree rise in temperature increased the risk of pre-term birth by 8.6 percent across 16 California counties, though that risk was higher for younger mothers and highest for African-American mothers (14.9 percent). It turns out that kidney stones are also more prevalent in hotter climates, because minerals build up under dehydration conditions. Projecting existing rates of kidney stones in nearby hot climates onto anticipated temperatures increases in California predicts that the state will see a 10.7 percent increase in risk of kidney stones by 2050. Climate change is also known to affect air quality as concentration of ground-level ozone is stoked by heat and methane emissions, while fine particulate matter in the air (typically known as PM2.5) is a product of wildfire smoke, which is expected to increase. Air pollution in the San Joaquin Valley already contributes to 460 premature deaths each year and approximately 3,230 cases of acute bronchitis in children — with projections for those numbers rising as air pollution worsens. Climate models project "large" wildfires are expected to increase in number by 21 percent by 2034, and with wildfire smoke comes a well-documented higher rate of hospitalizations and respiratory illnesses. During the 2015 wildfire season statewide, for example, there was a 171 percent increase in the risk of a pulmonary embolism during the heavy smoke periods. And during the 2003 fall fire in Southern California, acute bronchitis hospital admissions increased on average by 67 percent. 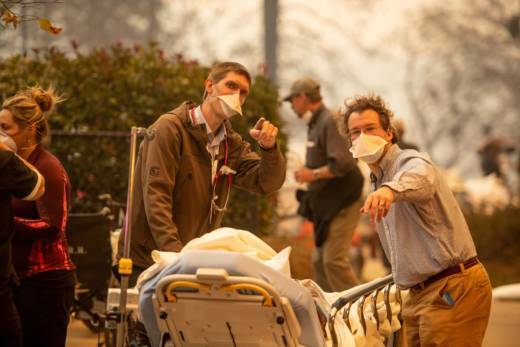 Even after the fires, admission rates for acute bronchitis and pneumonia still went up. Valley fever is also on the rise as the soil dries out and people are more apt to breathe in the fungus that leads to the illness. Valley fever includes coughing, fever, chest pains and, in the worst conditions, can result in meningitis. Valley fever rose 34 percent from 2016 to 2017, with the heavy majority of the cases in the San Joaquin Valley. Droughts, floods and fires all have immediate health consequences. And there are documented increases in mental health issues, like PTSD, depression and suicidal thoughts. Disaster recovery is also known to hit vulnerable populations harder, especially those without insurance. But extreme weather events also have indirect health consequences. For example, in 1993 after several years of drought, a heavy rainfall in Tulare County led to an increase in Valley fever, because of the growth of fungus. The number of cases there spiked from an average of 450 annually to 1,208 cases that first year and over 4,000 cases the two following years. Flooding and heavy rains also lead to contamination of water supplies, which has been shown to lead to an increase in gastrointestinal illness. The changing climate also affects how communities are exposed to infectious diseases and can increase the number of rodents or insects carrying pathogens — a trend that's already already being seen. In 2007, there were 75 cases of Lyme disease reported statewide, while in 2016 there were 141 in just 33 counties. While climate was unlikely to be the sole driver of that increase, warming temperatures are expected to double the reproductive capacity of ticks, which carry Lyme disease, and peak tick activity is much longer in drier and warmer climates. Higher temperatures and drought also increase the number of mosquitoes and the transmission rates for West Nile virus. The recent drought led to the highest number of cases of West Nile virus in California, with 379 in 2013 alone. Agricultural and urban run-off in extreme flooding and heavy rainfall leads to an increase in bacterial contamination, and warming of surface water causes new bacterial and viral pathogens to emerge. "For decades, scientific evidence has unequivocally shown that climate change is a reality," concludes the report. "While opportunities to entirely prevent the effects of climate change have already passed, there is still a role for strong leadership in the public and private sectors to reduce the levels of projected damage and hardship...By building communities that are resilient to a changing environment, the most extreme effects of climate change may be minimized."